As we mentioned above, your air conditioner could be losing refrigerant. In this case, you may notice it’s not cooling as powerfully as it should. Many homeowners believe the myth that refrigerant is something that depletes anyway, like gasoline from a car, and that it must be replaced (recharged) on a routine basis. 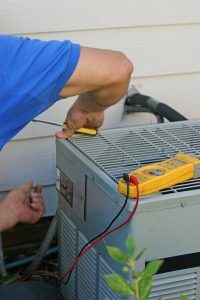 However, if your air conditioner is losing refrigerant, it means you have a leak that must be accurately located and repaired at the source, to ensure you don’t experience this issue again. The air filter that comes with your HVAC system upon installation is in place to protect the inside components from dirt, dust, and other debris that can negatively impact the inside components of the system. When the air filter gets too clogged up with dirt, airflow is restricted, which causes your air conditioner to have to work too hard. This leads to increased wear and tear on the system as well as other operational problems. You should be changing or cleaning your air filter every 1-3 months during periods of use, depending on the type of air filter you have and the level of contaminants in your home. There’s not a whole lot repair wise that you can do about this one, but if your air conditioner reaches a certain age, it will have accumulated so much natural wear and tear that it simply won’t be able to perform as it once did. Lifespan depends on the manufacturer and how diligent you are about keeping up on maintenance. But, the general rule is that if your AC system is over a decade old, and you find yourself calling for repairs a couple times a year, it’s probably time for an air conditioner upgrade. Our #1 Troubleshooting Tip for a Malfunctioning AC! You probably won’t be too surprised by this, but our #1 tip is to call in a pro! Attempting to formally diagnose and repair a cooling system problem can result in only more problems for the system, as you can do more harm than good. Additionally, without the proper training and education in HVAC equipment and technology, you could end up injuring yourself. Or, you may not fix the problem at all, leading you to have to call in a pro anyway.